Keeping your email inbox lean and clean can be a daunting task – especially if you receive more than just a few messages daily. Between multiple email accounts, the mix of personal, work-related and marketing messages and the absolute junk that never stops flowing in, it’s no wonder we don’t go crazy with all that bombards us 24/7. One secret is to separate all the different types of messages that come in. For example, you would want to keep your credit card statements apart from work-related messages. Similarly, personal email would probably not want to mixing with marketing offers. There are many different ways to handle this, but three come to mind: Create “rules” that filter your mail, establish a “junk” email address and DELETE REGULARLY! Every email program allows you to create rules to better organize your messages by delivering them into predefined folders. In both Outlook/Entourage and Apple Mail (the most prevalent email clients), it’s a no-brainer – in Outlook it’s found under TOOLS and in Apple Mail, it’s in PREFERENCES. As far as creating additional folders to further organize your inbox, I’ll include instructions in my September 2013 newsletter. A Gmail account is perfect for receiving messages from J. Crew, Best Buy and every other retailer out there. Simply create an account that you give to retailers and anybody who wants to use your email address for their benefit, not yours. 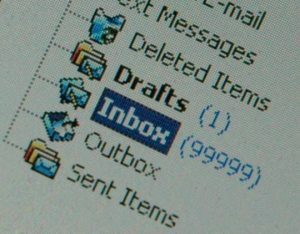 I work with many email hoarders – every message they’ve ever received is saved. Email offers from Omaha Steaks that expire in October 2010 are saved – and usually unopened! The quickest way to get rid these types of messages is to sort your inbox by “From” and delete entire groups at once. Take a good look at your habits – and decide for yourself if you’ve become a digital hoarder. If you have thousands of unopened emails, try to unsubscribe from those lists. Face it – if you don’t read your “Daily Jimmy Fallon Twitter Update” the day it arrives, you’re not going to read it. Ever. Unsubscribe with a vengeance – your life will be better for it, trust me.